French aero engines during the early years of the WWI seemed to settle on the rotary, a type that was simple, offered good power and was reliable. However, there were drawbacks with the type in that there was a definite limitation on the power available and there was the incredible torque reaction provided by the basic engine design. In early 1915 a light weight water cooled V-8 was developed that had a major impact on French and Allied aero engine design. In late 1915 S.P.A.D. developed a single-seat biplane around the 140 Hispano-Suiza V-8. This design was developed as engine power was increased to 200hp and the SPAD VII fighter finally reached the front in late 1916. It quickly became popular, not only for its power, but also for its robust construction. Piloted by such luminaries as Fonch and Guynemer, the pilots of Esc 3 soon gained local ascendancy over the German planes. These were definitely an improvement over the current crop of Nieuports. Probably its only weakness was that it was still a single gun fighter. The other Allies and the Germans used twin gun planes for a considerable period before the French finally brought out the two gun Spad XIII in early 1918. Despite being over-gunned, superior tactics and the ability to dive at high speeds without losing wings made the Spad VII a very popular aircraft. Not only with the French but with other Allies such as the Italians and Russians. It was in use by the Lafayette Escadrille when it finally became the 103rd Aero Squadron in 1918. Spad VIIs were used by countries in Asia and by the US post war. 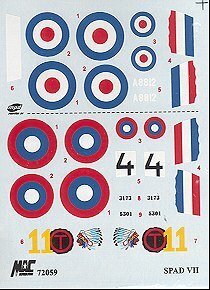 What we have here is basically a reboxing of the earlier Spad VII C.1 kit with new decals. Allow me to basically repeat what was said previously in case you missed that one. Molded in tan on a single sprue that barely fits the box, the MAC kit seems to be a major improvement over the only other readily available Spad VII previously done; that one from Airfix. The detailing is well done, if not a touch on the soft side. Flight surface ribbing is quite subdued and the fuselage isn't bad either. There are no problems with ejector pin marks/towers nor with sink areas or flash. Some parts have a bit more mold seam than others, but nothing major. As a simple kit, there are not that many parts. Interior is quite small and a combination of etched parts and plastic allow for it to be well detailed. There are optional parts for the radiator and windscreen. Also included are some skis but no instruction info is given on them. One can pretty well figure out what goes where, though. Etched brass is provided for several interior components, including a seat harness and for some strut braces and a steps. Instructions are well done with clear construction sequences and they provide color information where applicable. 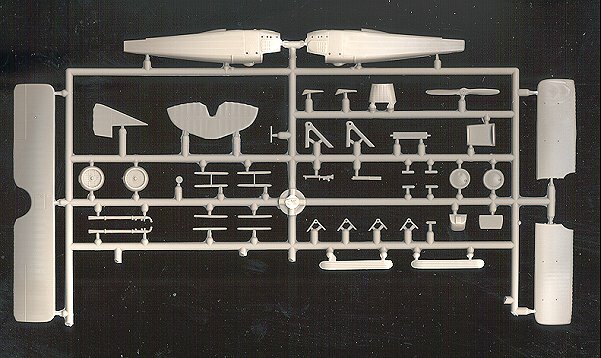 A rigging diagram is also provided, but it would be much better if it filled a larger space so it would be easier to see. There is plenty of white space on the page for this to be done. What makes this kit stand out from the previous one are the markings. There are schemes provided for two USAAS planes from the 103 Aero Squadron as flown by Capt William Thaw and by 1Lt Paul Baer. Both are camouflages in a the French disruptive scheme. There is a British aircraft from 30 Sq in Mesopotamia during March of 1918 and painted in standard British colors of Khaki PC 10 uppers and varnished linen undersides with grey metal panels. This aircraft has a Lewis gun mounted on the upper wing. Finally a Czech version from Kbely during 1921. It is fortunate that the Czechs decided to use the US WWI roundels for their colors after the US settled on the star marking. This plane is also in the French disruptive pattern. Decals are superbly done and should provide no problems. This kit should do as well as their previous effort. 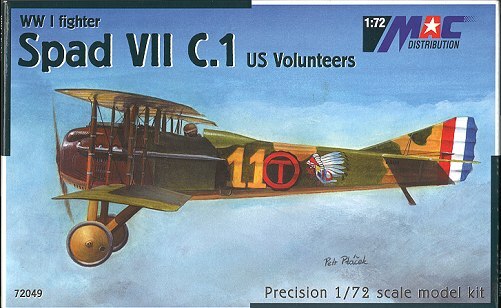 It makes into an excellent little model and is perfect for those who want a well detailed WWI Spad 7 to add to their collection.